Sumter Braves manager Ned Yost assessed his team at the start of the 1990 season and among the areas he liked, he told The Sumter Item, were his backup catchers. One of those backup catchers was Fred Lopez, a second-year pro out of the University of the Incarnate Word in Texas. But, while the other backup catcher Yost referred to, Eddie Perez, went on to a career in the majors, Lopez only played a total of three seasons as a pro. Lopez made AA, but he didn't make it higher. 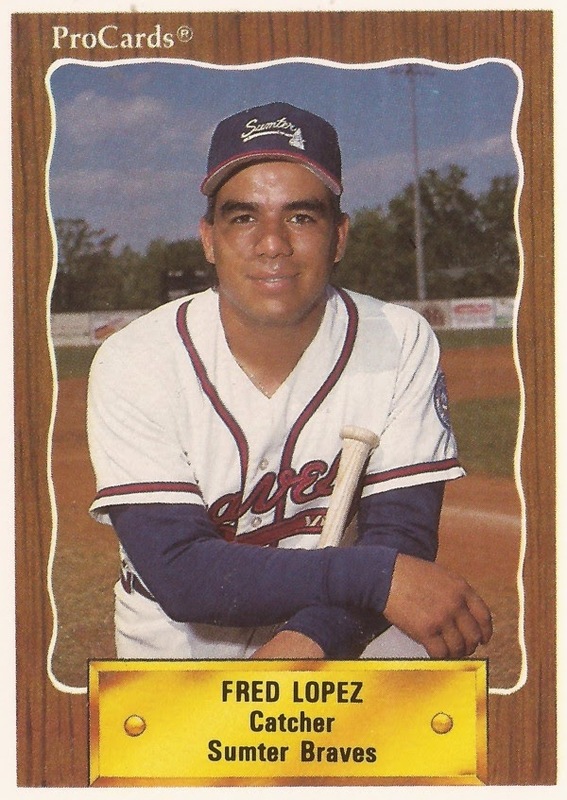 Lopez' career began in 1989, signed by the Braves as an undrafted free agent out of Incarnate Word. Lopez started with the Braves at rookie Idaho Falls. He got into 37 games and hit .222. He picked up a double and a triple and had eight RBI. He moved to single-A Sumter for 1990, but did about the same as Idaho Falls. He hit .224 in 53 games. He also hit a home run and had 13 RBI. In one June Sumter win over Augusta, Lopez went 3 for 4. He doubled and scored in another June game. Lopez moved up to AA Greenville for 1991, but he got into just 23 games. He hit .264 with another home run, but it was his final season as a pro.